According to this story at ESPN.com, the Ravens put the franchise tag on Terrell Suggs today. While this was expected, what may not have been expected is Sizzles’ apparent displeasure with the position he was tagged as. The Ravens slapped the franchise tag on Suggs as a linebacker, which gives him a 2008 salary of $8,065,000 – the average of the 5 highest paid LBs in the NFL. Suggs contests that he played more than 50% of the team’s defensive snaps at defensive end – DEs get paid more. Had he been franchised at DE, the Ravens would owe Sizzle $8,879,000 – a difference of $814,000. We had been under the impression that it was completely up to the Ravens what position they chose to franchise Suggs at, and that they would obviously choose LB, since it makes the most sense financially for the team. 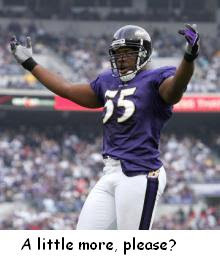 However, it now seems that Suggs will ask the NFL and the players’ association to look at the Ravens’ game films to determine if he did indeed play more than 50% of the snaps with his hand in the dirt, in which case the team may be mandated to give him the higher salary. Both parties seem eager to want to get a long-term deal done, but this hardly seems like a show of good faith on Suggs’ part. On the other hand though, how would you handle it if your employer tried to take 10% off your salary based solely on your title? This entry was posted on March 14, 2008 at 1:02 pm and is filed under News, Ravens. You can follow any responses to this entry through the RSS 2.0 feed. You can leave a response, or trackback from your own site.